It’s good to see that my readers are as split as I am on which yarn to go with for my Mariah. I’m still undecided so I’m going to let it mull for a little longer. 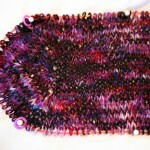 I bought a pack of Linen Drape over a year ago as part of the Alison’s Linen Drape Along. I think I tried a half dozen different patterns but none of them stuck. It’s been bugging me that the yarn is still in my stash and not being used. 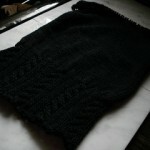 I was reading Jackie’s blog and saw that she started Wrapped Lace Cardi from VK Spring Summer 05. I love the sleeves but I can’t do eyelets across my bust. Then I remembered I recently bought this little shrug from Old Navy and I love it. Take the Linen Drape, knit up the sleeves from the Wrapped Lace Cardi, but do a solid body. The LD is a different gauge than the Glace used in the original, so a little math was in order. 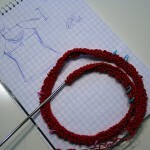 I’m starting on a front and I’ll do the whole body before switching to the sleeves. I’d love to make those beautiful full length sleeves but I’m not sure I have enough yarn. I have 9.5 balls and if my estimates are right I’ll need 3 full balls for the sleeves. Six balls should be enough for that small bodice but the ties have me wondering. I’ll have a better idea after I finish one front piece. Nothing like a little mystery to keep ya knittin’. Thanks for your offer about the tennis sweater pattern. I think I will have to compare it to the back – but I am headed back tomorrow – so the delay shouldn’t be too bad. Wow! This definitely sounds like a good plan. I will eagerly follow your process. I can’t wait until I’m to the point where I can visualize putting two different patterns or ideas together and then actually DO it! At the rate I’m going, I think it’s possible someday. Ooh, how exciting! I’m anxious to see how it works out! Lacy sleeves and solid body sounds great. If you do run out of yarn, you can always make the ties out of ribbon.